Keep your canine companion warm and dry. Available in sizes and colors to accommidate most dogs. Sizes are measured from base of the neck to base of the tail. 1 Year Limited Warranty! 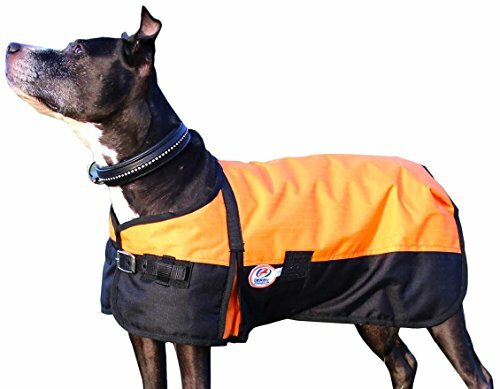 KEEP YOUR DOG WARM - Constructed with 150 grams of poly fill insulation that will dampen the harshness of miserable weather conditions from your dog. The 210 denier lining is breathable, comfortable, and durable. HIGH QUALITY MATERIAL & DESIGN - These blankets are made to endure with a 600 Denier Rip Stop Waterproof Outer Shell. Shoulder gussets extend the range of motion so your dog can play hard without constriction. The outer shell repels water and any excess debris can be easily wiped off without staining the coat. ADJUSTABLE CHEST BUCKLES & BELLY BAND - Create a snug fit with adjustable chest buckles and an elastic belly wrap with quick-grip closure. Refer to the size chart in the images to see the adjustability range. IMPROVED SIZING CHART - Measurements vary from manufacturer to manufacturer. These blankets run on the larger side. Please measure your doing and refer to the sizing chart located within the images before placing your order. FUN COLORS - There is a great selection of bright colors that will look great on your dog.